A chess set consists of 32 chess pieces, including 16 pawns, 4 Rooks, 4 Knights, 4 Bishops, 2 Queens and 2 Kings. 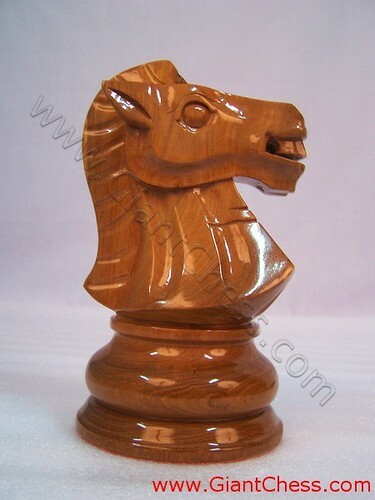 This time we present the Knight chess pieces that polish in brown and glossy look. It is one of chess set pieces sized 12 inch, very similar to our 8 inch. The board for this size is 6″ x 6″ squares. Both chess set and board can also be easily transported to wherever one might wish to play, but may be even more suited to outdoor play – such as in yard, garden, park, or at beach. All that is needed is a balmy day, a flat surface, and a friend with whom to play.